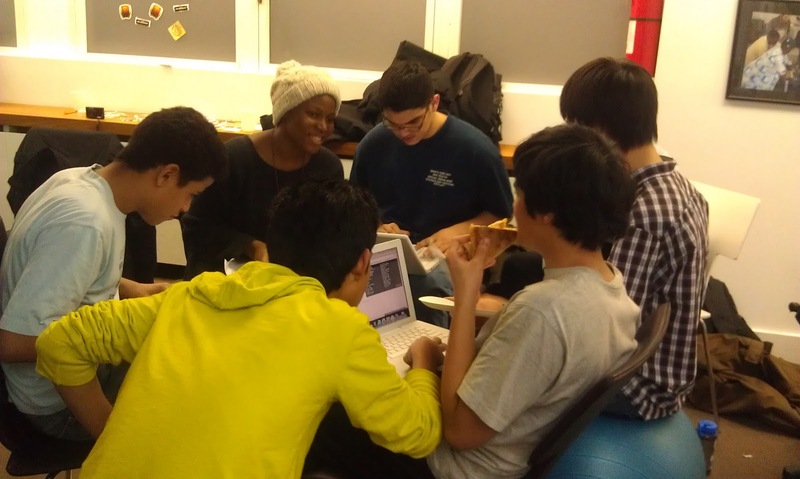 Yesterday the Hive Mozilla Youth Ambassadors ran their first event as facilitators. 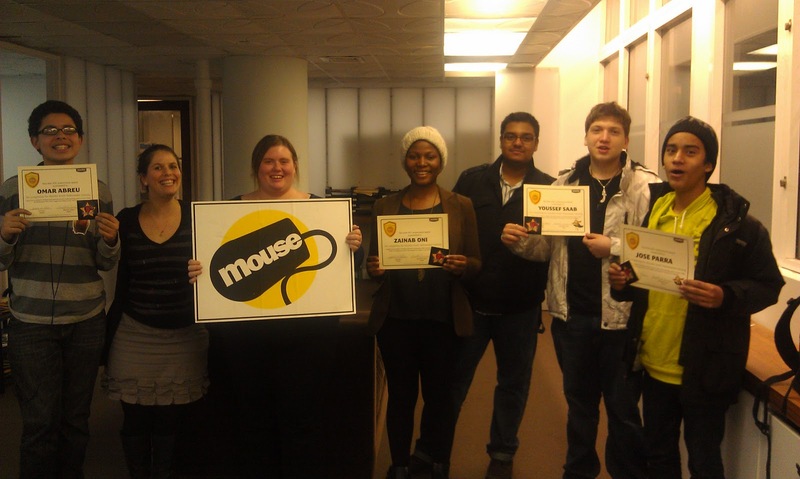 The hack jam was held at the Mouse headquarters and we had a nice mix of youth, adult "squad leaders" and adult program coordinators from the Mouse staff. The youth facilitators came a few hours early to prepare for the event and do a walk through of the event plan. 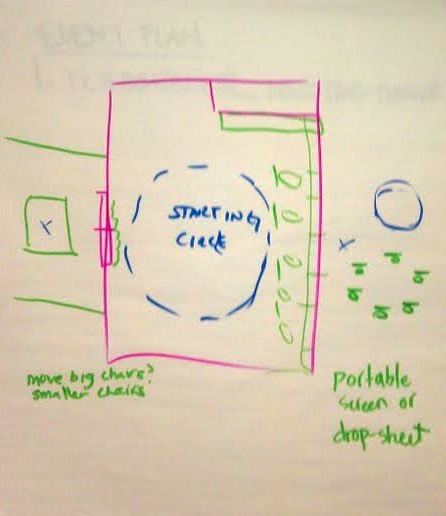 There was a lot of set up work to do, including: making a screen for the projector (see below), putting out the chairs, making sure the X- Ray goggles bookmarklet was installed on all the computers, and checking that the laptops were fully charged. 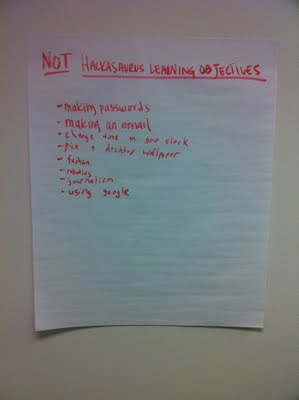 This was a bit tedious, but we referred to the "IT Checklist" included in the Hacktivity Kit for pointers. Before the event started, we paired off and role played "worst case scenarios" and facilitated them. We had a lot of fun pretending to not know how to navigate webpages! Finally, event participants arrived and we kicked things off with a welcome and the "Hack Dance Battle" icebreaker. Zainab acted as emcee for the youth jam and thanked everyone for coming. Youseff then promptly asked everyone to get our of their seats and to get their groove on with some hackable dancing. (Neil dj-ed and we played a LOT of the Combination Pizza Hut and Taco Bell song) Omar lead the group discussion about what we mean when we say hack. We then showed the two videos that the youth created on the topics of "What is Hackasaurus" and "Why You Should Learn to Code." Check out the REMIXED video that Omar and Youssef made here. 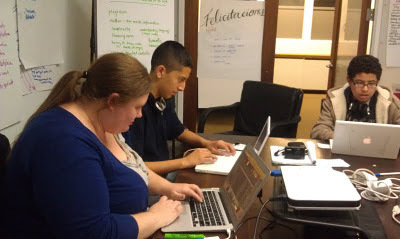 Today was the second HIVE Mozilla Youth Ambassador training at Mouse. 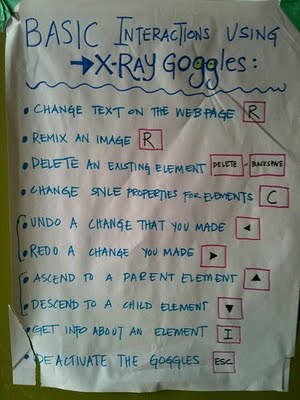 Today was focused on making that pivotal move from hacking bits and pieces of the web with the X-Ray Goggles to designing webpages with HTML and style. 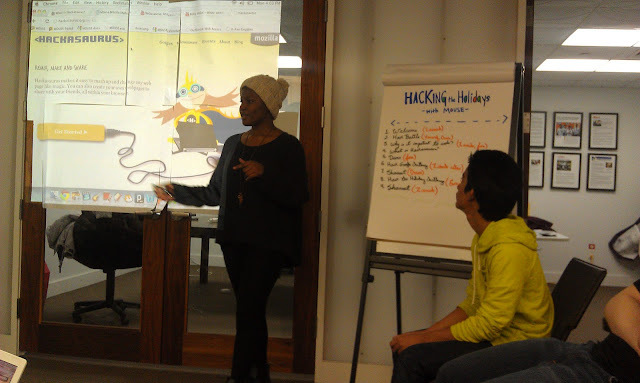 This was the first time that I have ever lead a followup workshop to the initial "hack jam" type workshops where participants learned about the open web, what we mean by "hacking" and an intro to the Hackasaurus tools. For me this workshop is very important because it moves from the "a ha" moment that many users have when using the googles to look under the hood of a webpage, to the "roll up the sleeves" and get to work phase. Or, as Mimi Ito might say- from messing around to geeking out. 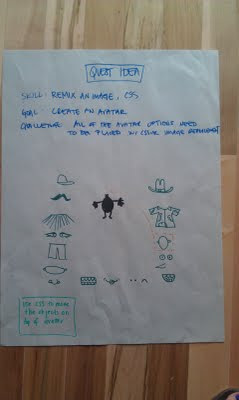 We started out by stretching our content creation muscles with the Superhero Design Challenge. 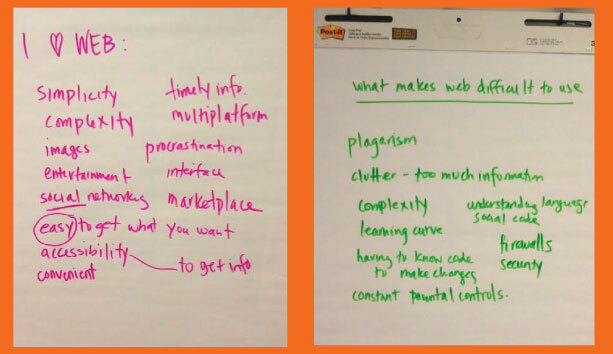 Participants were asked to look back at the "I think X makes the web special" and the "I think that X makes the web difficult to use" brainstorms that we did in session 1. They chose one aspect of the web to defend or compete against if they were a Superhero of the Open Web. 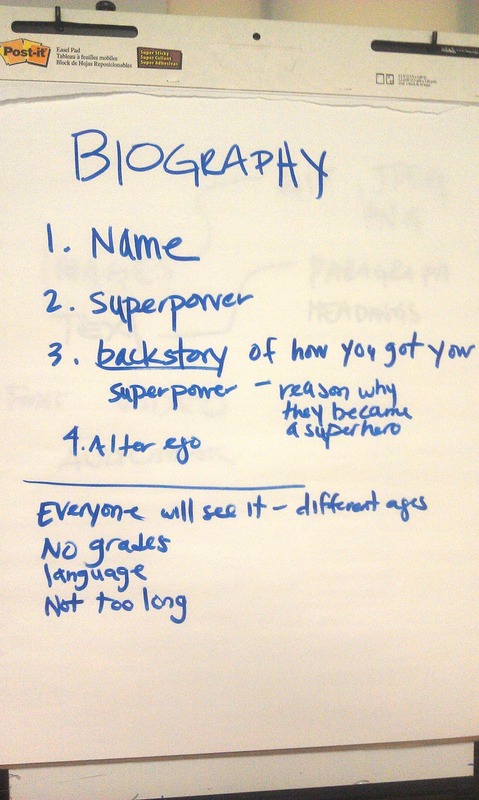 They then used this as the basis for creating a short web- ready biography for their fictional superhero of the open web. We discussed what makes a good bio as well as what makes for good writing on the web. They remixed the html and style with the X- Ray Goggles and presented their projects and talked a bit about how they trouble shooted problems with the coding. We then discussed the various components that make up a webpage, including: HTML, CSS, graphic assets and text content and reviewed that the combination of an opening tag and its corresponding closing tag and the content in between is called an element. 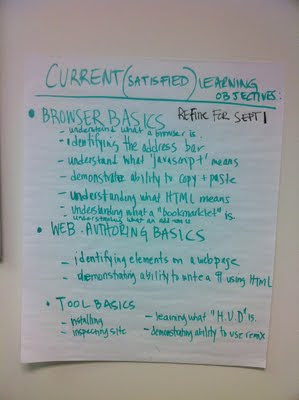 The final challenge for this workshop was to make an instructional "how to" webpage from a template- without the goggles. In order to do this, we all came up with things that we we experts at- we had a peanut butter and jelly maker, a hand turkey illustrator, a good music connoisseur! 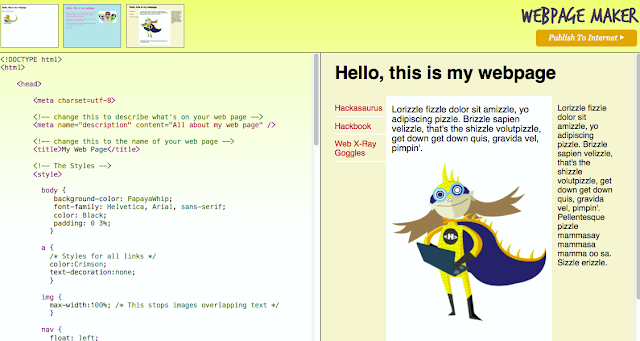 I gave everyone a crash course in web DESIGN. We talked about the importance in identifying a user and designed information architecture as well as wireframes for all of the sites. Participants used a prototype that Atul Varma and I worked on as a spin off of the Hackbook that Anna Debenham created to help users craft webpages from templates. In the end, everyone made the "how to" pages and we all critiqued the structure, style and design of each presenters work. Overall the workshop was a success - we user tested old and new tools as well as curriculum and workshop participants came a way with 2 webpages that they made in a stretch of 4 hours! 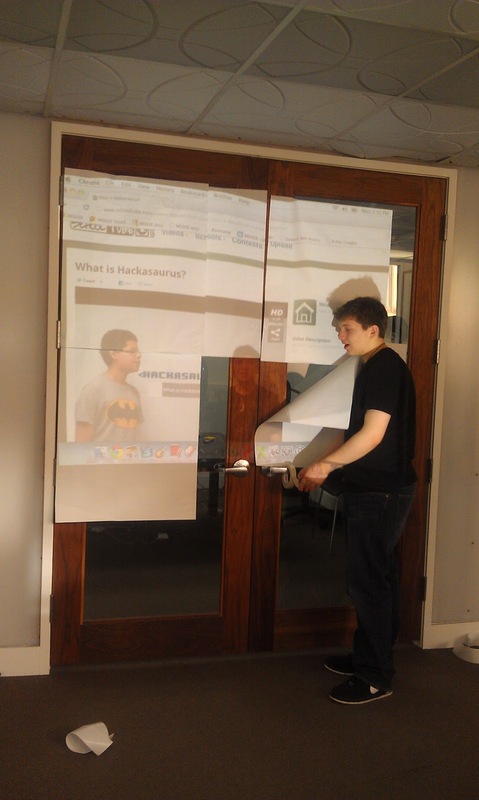 Next Up: How to Run a Hack Jam on Friday. Yesterday I lead the first of a series of 4 hour intensive learning labs at Mouse. This series of workshops will train youth to become what I am calling Mozilla Youth Ambassadors (it's a working title). 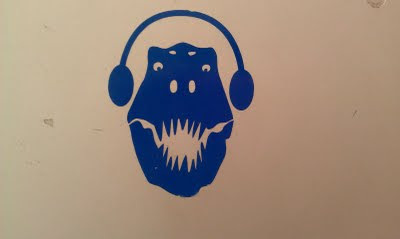 That means that youth will learn Hackasaurus, HTML, CSS and facilitation in order to run hacking events and/or clubs. You can follow our group blog here. We decided to test their definitions. The next challenge was to hack a board game. Our two teams chose to hack tic tac toe (which became Finger Tac) and monopoly (which became Hackopoly). The teams wrote new rules and then playtested each others games. 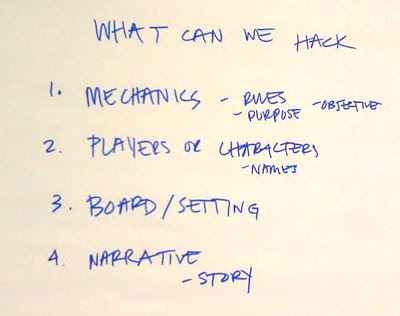 Throughout the course of the activity, we talked about our process and what options we had in terms of hacking the games. 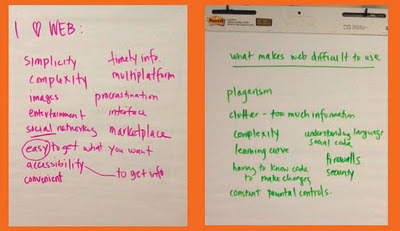 We then talked about how the web was designed to be participatory and collaborative. 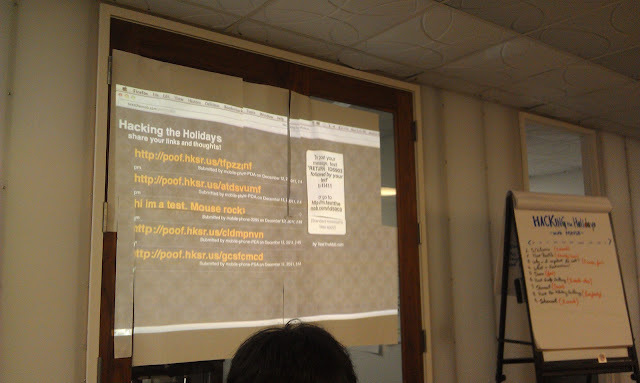 We looked at a slide show that I created as part of the Hacktivity kit. It was nice to user test that- it worked really well. I think I am going to change some of the slides about installation because they are outdated since we changed the interface for the tools. 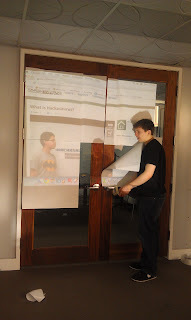 After a brief intro to the X-Ray Goggles, the teens hacked Google, and then I challenged them to hack a website of their choosing. The goal was to make as many changes as possible to hide the identity of the original site. 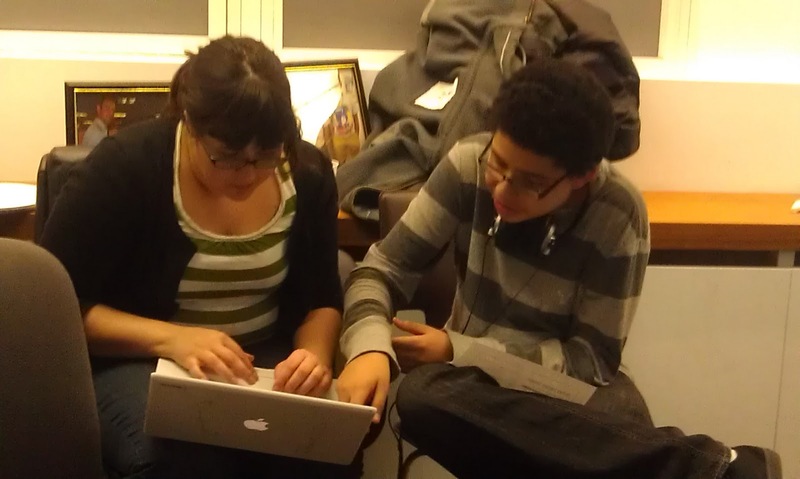 The teens hacked facebook, Tumblr, the NYC MTA page, Twitter, Apple and even the Mouse page! Our next workshop is tomorrow. We will be learning HTML and CSS and moving from hacking to webmaking! 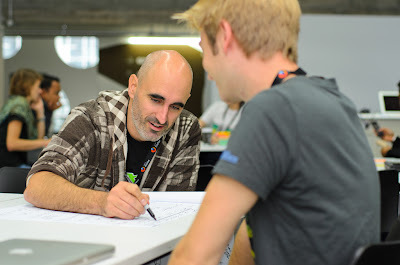 Last weekend I had the opportunity to go to MozCamp EU in Berlin . It was a truly inspiring experience- meeting community members from all over the world. I really learned a lot about localization. It was at once exciting and educational for me to learn to the extent that I did about how to reach a global community with my work from a global community. There were so many new faces and names, I just wanted to take this opportunity to say hello and how honored I am to be amongst you. This past weekend the Hackasaurus team was part of the Media, Freedom and the Web conference in London. 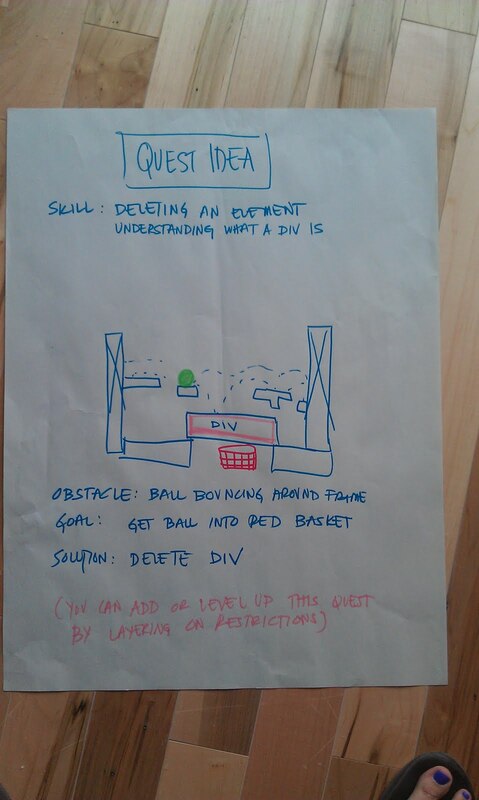 3 days = Hive London Pop Up for youth, 3 design challenge sessions + 2 game prototypes for the project. Whew! I thought it would be fun to re-hash the design challenge that we did with participants, because we ended up with 2 really useful prototypes that got me thinking about the future direction of the project. 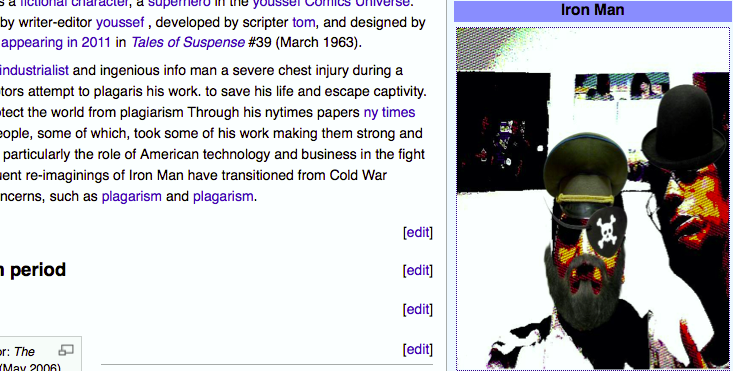 Interested in making a hackable comic book featuring superheroes of the open web? 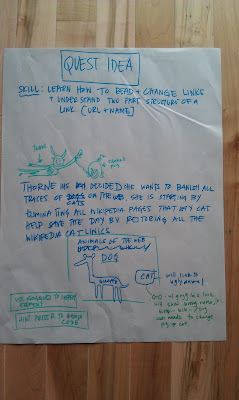 Or maybe an interactive story embedded with quests for webmakers? 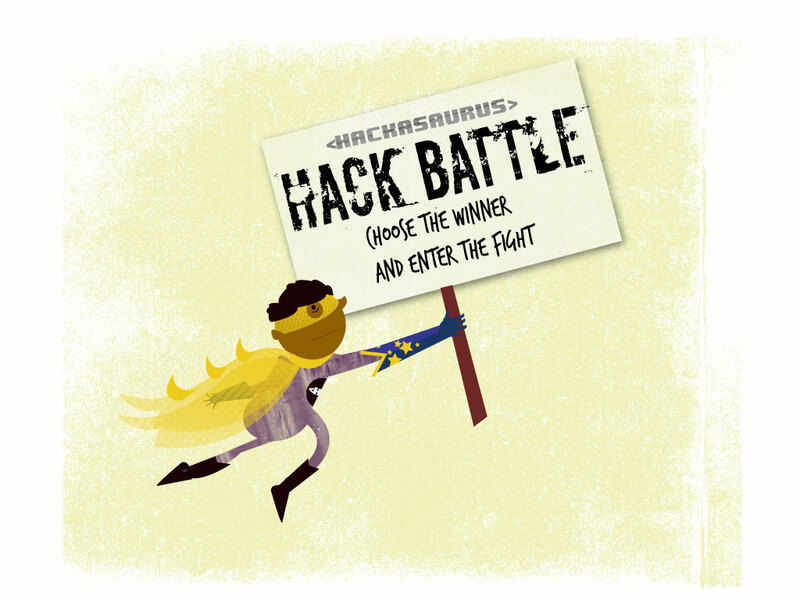 We want you to bring the spirit of the Hackasaurus design jam- online -- with a self-directed learning experience on www.hackasaurus.org. This is an opportunity to think creatively about how to teach HTML and CSS to middle school aged youth (10-15 year olds). We have designed a toolkit for Web designers and developers, that will give you all of the assets that you need to create an engaging online activity. 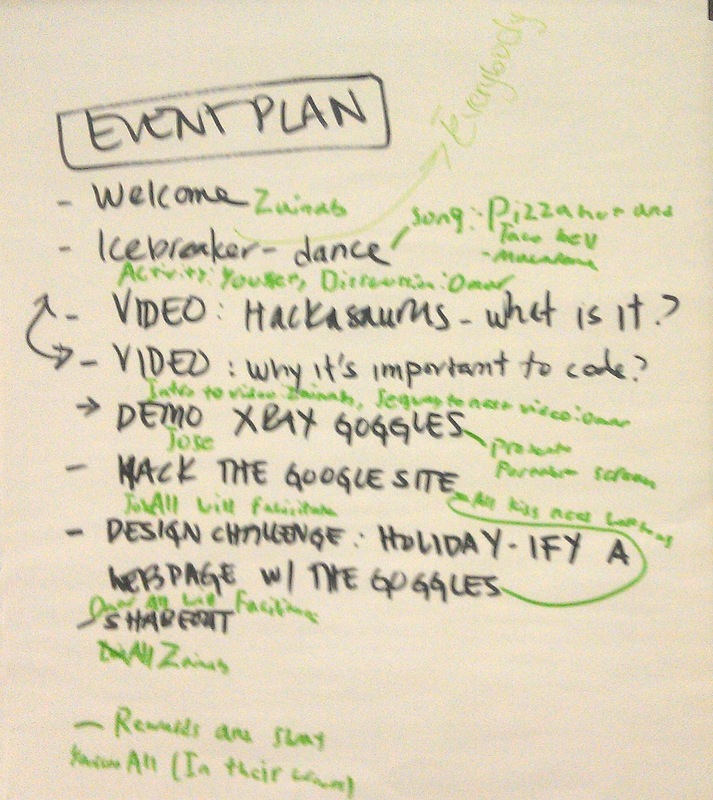 The workshop started with our hack-the-dance icebreaker that we do with youth at hack jams. We did this because a) it's a whole lot of fun and b) we wanted to set the tone that we were building playful interactions for youth to learn HTML and CSS using the Hackasaurus X Ray Goggles. 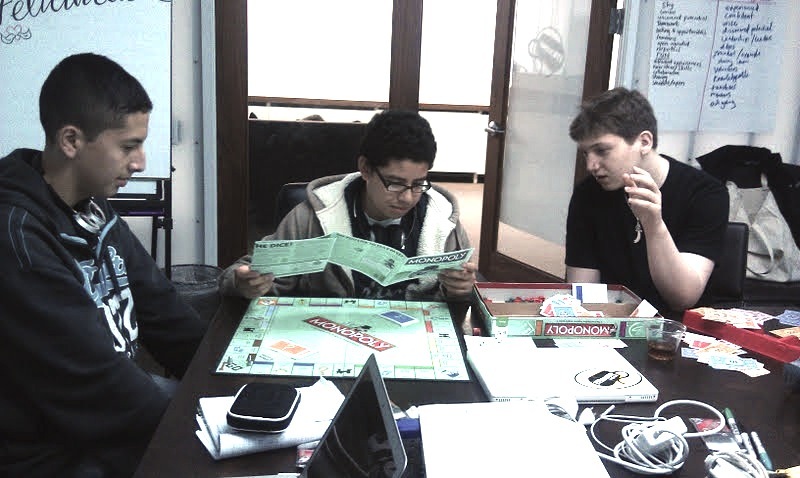 After we got loose, we kicked off with a brainstorm game. 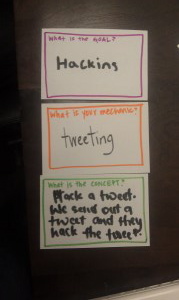 Everyone broke into groups and were given three cards- a learning goal, a mechanic and an end product and they had to come up with a concept for a Hackasaurus learning project based on that. We played 3 rounds, and in each round the participants were given the chance to write - in more and more information on the cards. 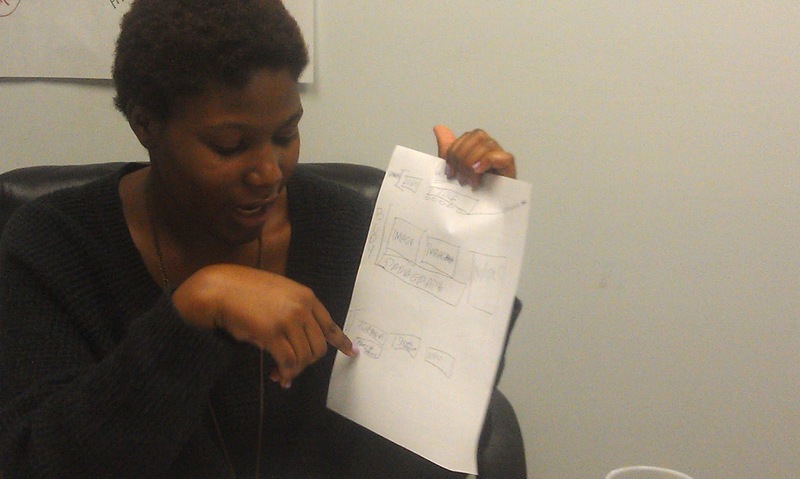 As a result- we came up with about 7 different ideas for what we could prototype. We defined prototyping really loosely- it could be a storyboard, a sticky sketch, a tweet, an interactive website- whatever you needed to do to just communicate your IDEA. Participants self-organized into groups and by the end of the day we had two distinct projects: Doctor Web and Hacker Battle. 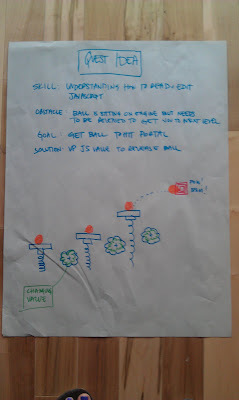 Even though the groups started out with 2 ideas- after numerous iterations and sketches, the concepts morphed. For example, one group- started out with this idea for a Popcorn.js curated Hack gallery for users to display their remixed websites- however, after pitching to our group and getting feedback and iterating on the concept- that exact idea turned into a Hack Battle game where participants could post their hacked websites up on to a challenge page and compete against other users who changed the code on the same website. Concept: You are a doctor responding to a medical emergency! Your interns incorrectly fixed a patient (Website Master) and now he is a complete mess. 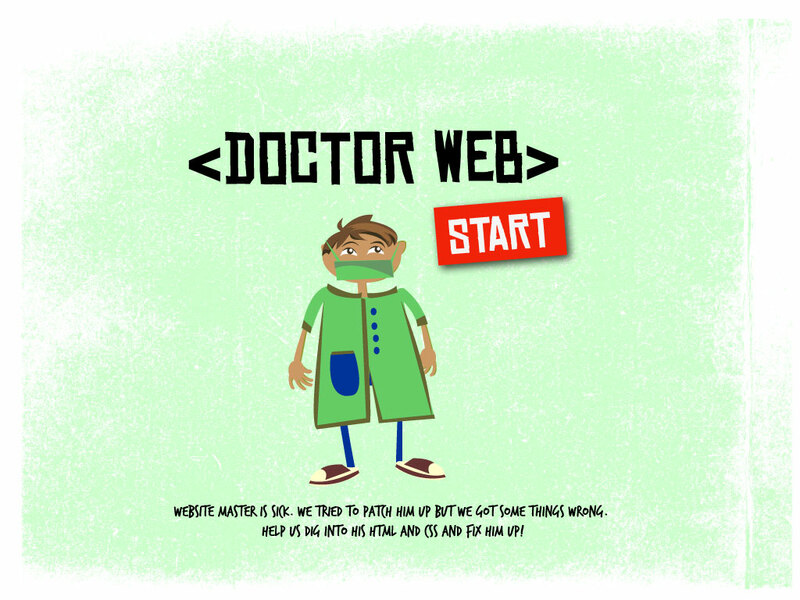 It's your job to dig into his HTML and CSS to fix him up- but hurry up before his health completely depletes! 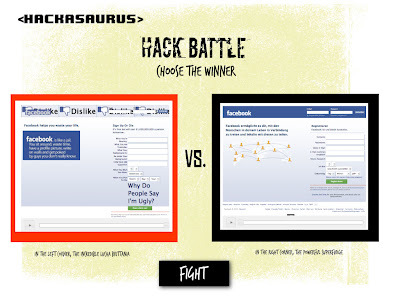 Concept: After learners remix a website - they can submit their hack into the Hack battle where website visitors vote on the best hacked version of whatever website the learner started from. We demo-ed the prototypes at the Mozilla closing circle and received some positive feedback. So what now? 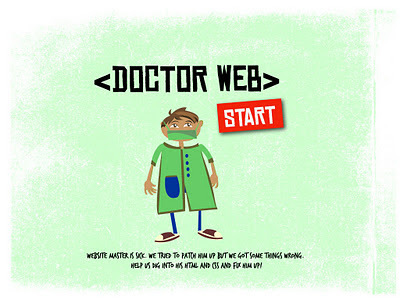 I feel very excited about the possibility of these prototypes because they fill two voids in our project: Doctor Web gives users a playful introduction to both the X-Ray Goggles and HTML/CSS and Hack Battle provides a social, community space for users to collaborate and communicate. We need to continue building out these prototypes. One of the great things about the Festival was that we had the end-user in the room with us developing, that is- a teenager. Also- we had a plethora of experts helping to design these experiences. Let's continue to work together- because, clearly, the power of numbers and the diversity of community members engaged in webmaking and media-making has proven to be a huge win for us. This week I have been working on building out the educational objectives, sample lesson plan and assessment rubric to go in the Hackasaurus jam-in-a-box. The process for this has been interesting because I am trying to do this in an "open" manner so that it is truly designed as an open educational resource. In order to do this I found myself working on a strategy to engage the education community to help review my work and most importantly iterate and come up with new ideas. 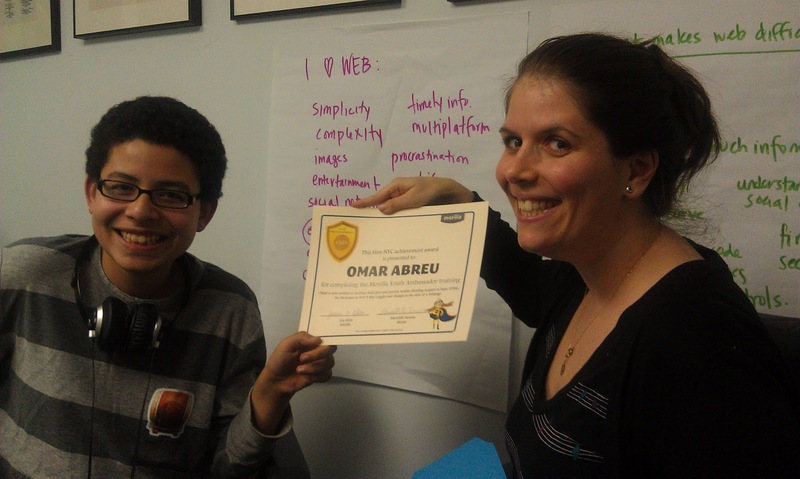 "I know absolutely nothing about code or html, but I want to learn and help the project succeed." "I would like to try and help. I have daughters now in bother senior / junior so it may be possible for me to run a Hackasaurus event." This is really positive and so now the challenge becomes, what is the best way to work collaboratively with all of these kinds of contributors? At the moment, I am building out the jam-in-a-box on a wiki and then, connecting content mostly through etherpads. This is kind of a hacky way of being collaborative. 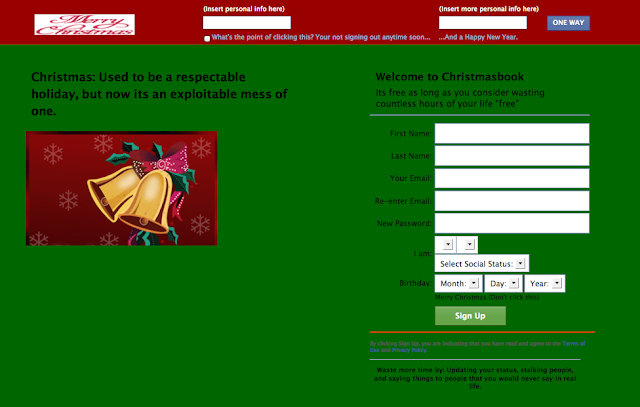 It really just let's people contribute by editing, but doesn't truly encourage webmaking. I am inspired a bit by the way that p2pu is developing out their challenge template and I see that this is on git so Atul and I might fork it and try to develop it out for our purposes. 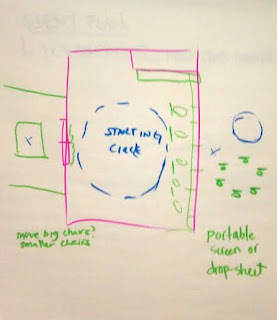 I like how essentially it is a table... but in my mind it is a sharing repository where educators can post lesson plans and resources, and just like git hub- fork ideas and build upon them and post new ideas. It can be searched, used and built upon. I would love to hear other ways that could support working in the open- and I mean working- webmaking, not just editing! Happy first day of back-to-school for many of you! 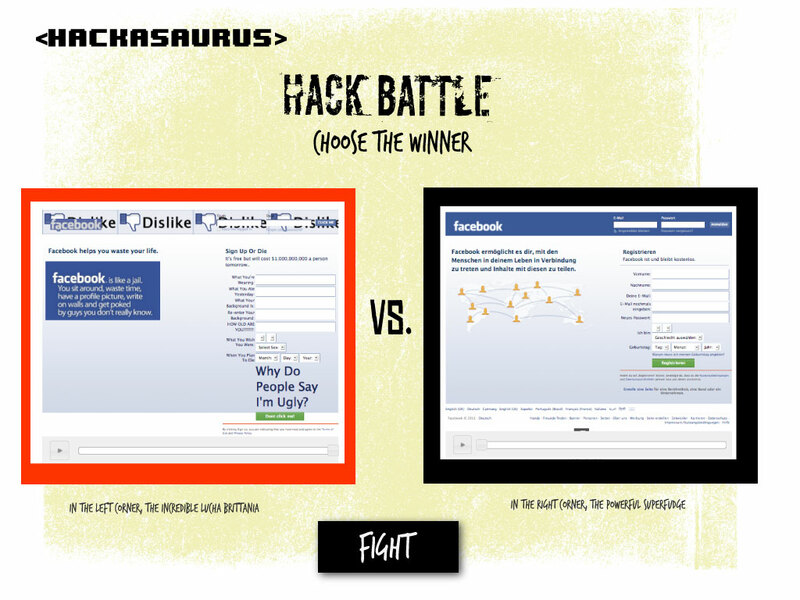 I am writing because we are coming very close to shipping beta for Hackasaurus and I wanted to see if any educators are interested in working with me to give feedback and iterate on some of the Open Educational Resource materials that we are building. 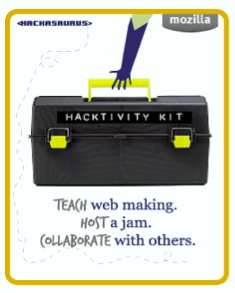 These resources include the design jam-in-a-box which gives you all of the tools that you need to run a Hackasaurus event- whether you are a teacher, parent, informal educator or a teen running a workshop. In the next ten days I would like to get some specific feedback on the learning goals, learning assessment rubric and a superhero of the open web lesson plan/ design challenge. 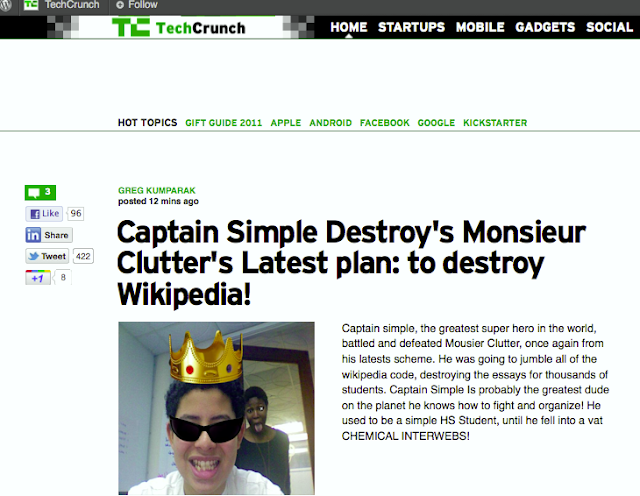 Thanks and happy hacking and webmaking! Badges are huge topic in the digital media and learning world and something that I have been working with in some form ever since I have entered into the realm of educational technology. To be honest, I have struggled with my feeling towards badges, that is to say, assessment for skills that you aren't always given credit for. Badges give you public recognition for your skills, achievements and learning beyond the classroom -- unlocking job and educational opportunities. The reason that I struggle is that I am concerned that badges allow you to formalize something that is blissfully informal. One example of my fear around this was when I was in Barcelona at the Learning, Freedom and the Web festival. 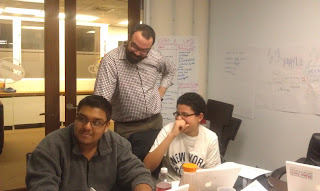 My colleague Jack Martin and I participated in this local learning incubator where we told a story with twitter. It was a fantastic and fun day and we loved what we made just as much as we did making it. However, after the activity was over, a learning assessment team came over during our presentation of our story and gave us badges for our story. It somehow cheapened the experience that Jack and I had and sort of reminded me that, yeah this was about learning and grading-not the fun experience. Ok, now that I have that off my shoulders- I find the idea of using badges to assess web design skills intriguing. Many web designers and developers learned webmaking skills in informal settings- hanging out with friends, navigating the web on their own, tinkering with blog sites. However, theses skills equate to real life work competencies that often need to be proven in some form when you are applying for work (for example). What if there WAS a way to say, bring along some form of street cred and accreditation into your interviews along with your portfolio? 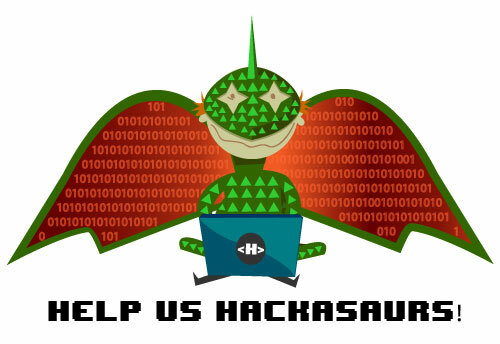 So with all of this enthusiasm, and mild trepidation- I started to look at the learning objectives for Hackasaurus and, with the help of Matt Thompson and Atul Varma, started to answer the question: if Hackasaurus had a system for badges what would the badges look like? The badges I came up with are described here. It's just a barely baked idea, and Atul, Matt and I are really just starting to tinker with how badges could support the learning experience. We won't be actually implementing this online for a little bit, however, I would love to hear your thoughts on how this maps to the learning outcomes and if you have any other ideas. 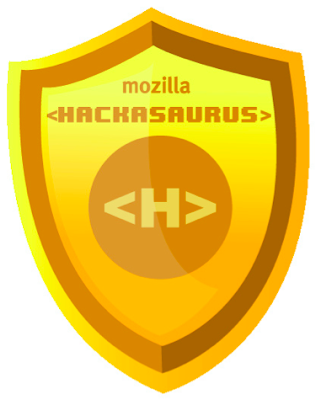 The Tuesday Hackasaurus community call will focus on badges. Join us if you have the time. While many people speak about how Hackasaurus is an open source development project, I think that it is important to note that this is an open educational resource project (OER) as well. What is particularly challenging and stimulating about the work that I do is that I am integrating ideas and creative thinking of both technologists and educators on a daily basis. The project was birthed out of conversations between Mozilla and The Hive Learning Networks in New York and Chicago. Some of the initial test beds for the project were the New York Pubic Library, The Chicago Public Library YouMedia and the New York Hall of Science. The Hive involvement in the project is still strong and we have more contributors including the Digital Youth Network, Eyebeam, The National Writing Project, the Institute of Play and Mouse, as well as many international contributors, including Brussels, Barcelona, the United Kingdom and Nigeria. The strong involvement of these organizations as well as individual educators who have volunteered their time and energy towards Hackasaurus helps to strengthen the design of the tools as well as the curricular aspects of the project. 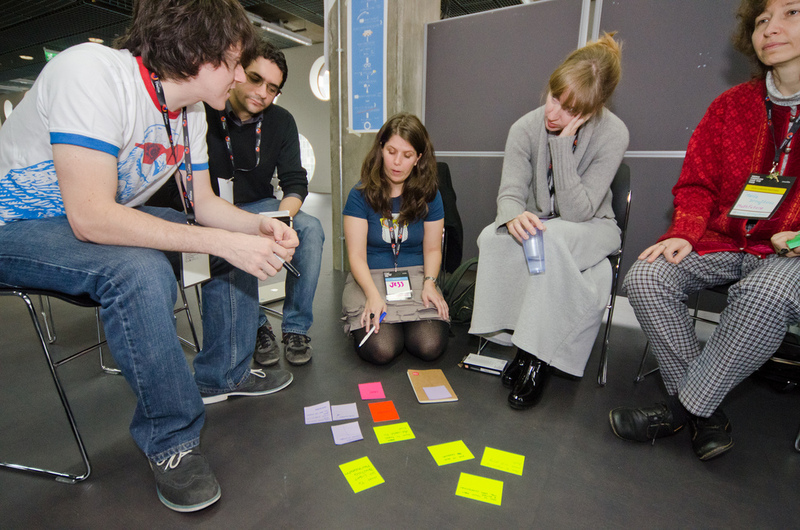 The development team of the project and the learning experience team worked together to iterate on defining the learning objectives for the project. I am sharing with you a bit of our thinking around this because I feel that it is truly interesting to see how our project has evolved over the past year as well as where we believe that we are headed. We initially came up with a set of learning objectives that we know we are currently satisfying with our tools and design jams. The objectives sketched out here more or less fit into three categories: browser basics, web making basics and tool basics. "It's better to teach kids how to tie their shoelaces (an "open" skill needed for making knots, useful for many other purposes) vs just making them use shoes with easy Velcro fasteners (which is also much less challenging for developing fine motor skills)." This process was really interesting because it was a mix of the technical side of building for the web with the emotional side of creating- that is, acknowledging that humans are crafting the web and thus, have a responsibility to themselves and others to understand the power of their medium. 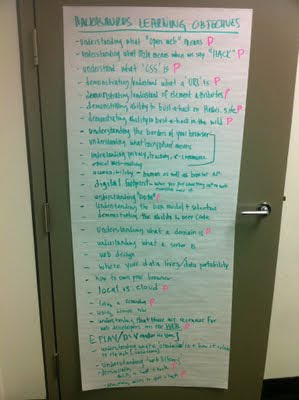 Finally, and this was probably the most difficult part for us, we started to list what are NOT our learning objectives. Yeah, this list is probably too short, but I think that it is a good place for us to begin. 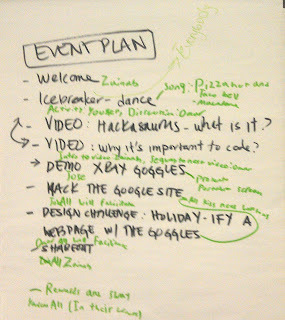 Ultimately the learning experience that we are interested in supporting is that of a web maker, someone who is thinking of the web as a place for designing, crafting, challenging and coding, which allowed us to remove some of the other areas that are tangentially associated with the work we do, but are not our direct focus. Last week, Atul Varma, David Humphrey and I took some time to think about crafting specific missions or quests that were directly mapped to initial interactions or skills that can be acquired when using the Hackasaurus X Ray Goggles. These training missions are being thought of as a way to introduce a new user to the "Hackasaurus" experience (no relation to the Jimi Hendrix Experience). 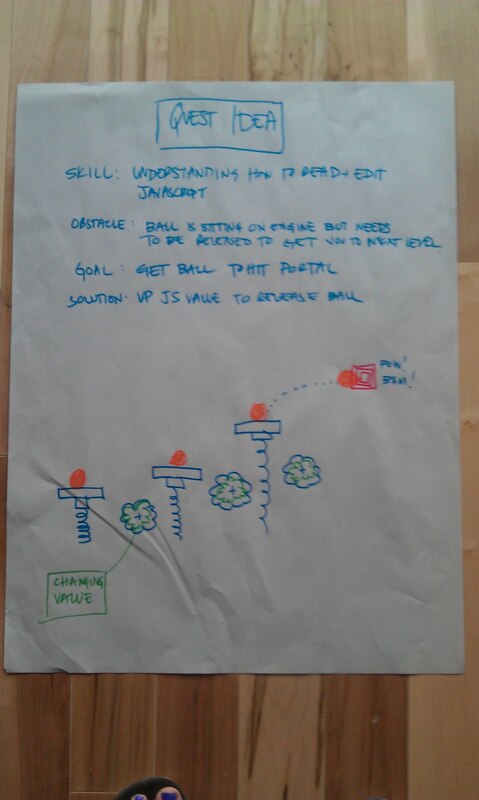 Here is a little summary of our prototyping session. 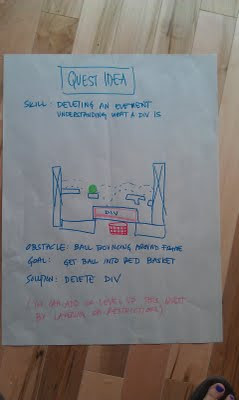 The idea here is that the ball is moving around the frame (which has kind of a Super Mario Brothers set) and the goal is to get the ball into the basket which cant be done until you delete the div of the bar that is blocking the basket, using the goggles of course. This sketch shows that a user can use css to create an avatar . The idea would be that using the goggles with the CSS functionality (and even html editing) you can either reposition the objects to cover the avatar body and/or add your own elements to personalize it. In the future at some point, we will prototype these using the repository on GitHub that Atul made for Hacker Parcours and game like creations. As I mentioned, last week I worked with Anna Debenham and some local tweens from Toronto on this hackable comic idea. We prototyped a simple storyboard for what could be the intro to the comic- how the main character (currently Sue) acquires her superpowers of hacking the world wide web for the good of the world. 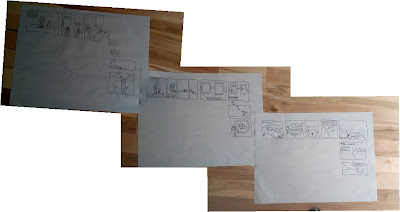 I drew up the comic and played around quite a bit with navigation (horizontal vs vertical vs ZOOM). 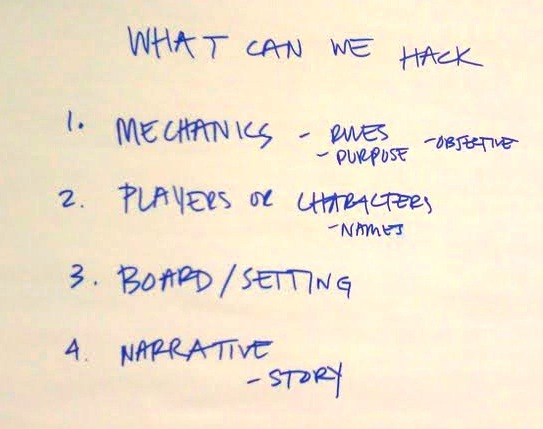 Additionally, we started to think about how we could incorporate actual hacking in the comic. There is a moment for activating the goggles and a sketch about how one of the characters is saved by the deletion of an element using HTML. Click on the image and go to Flickr for the best viewing. I annotated the flickr version with tons of notes to explain both the story and the interactivity. 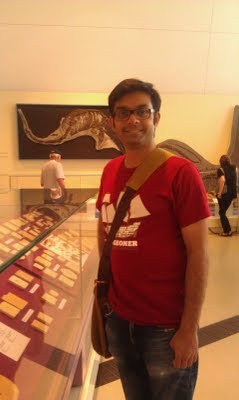 Atul loves looking at fossils! This is the icon on the displays to show when to use the audio tour. Pretty awesome, right? 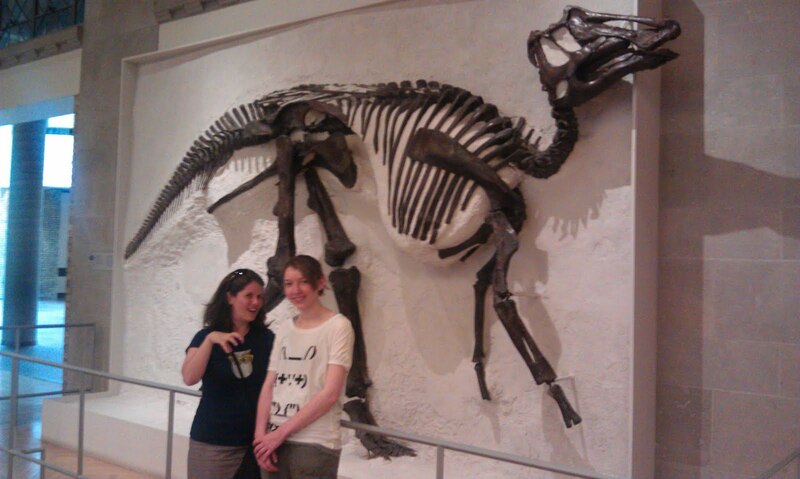 Although there were no Hackasaur sightings, we have informed the paleontologists that they should start researching around the new Mozilla office stomping grounds- just in case.